HARPER, Robert Goodloe, a Representative from South Carolina and a Senator from Maryland; born near Fredericksburg, Va., in January 1765; moved with his parents to Granville, N.C., about 1769; received his early education at home and later attended grammar school; joined a volunteer corps of Cavalry when only fifteen years of age and served in the Revolutionary Army; made a surveying tour through Kentucky and Tennessee in 1783; graduated from the College of New Jersey (now Princeton University) in 1785; studied law in Charleston, S.C., teaching school at the same time; admitted to the bar in 1786 and commenced practice in Ninety-Sixth District, S.C.; moved to Charleston, S.C., in 1789; member, State house of representatives 1790-1795; elected from South Carolina to the Third Congress to fill the vacancy caused by the death of Alexander Gillon; reelected to the Fourth, Fifth, and Sixth Congresses and served from February 1795 to March 1801; unsuccessful candidate for reelection in 1800 to the Seventh Congress; chairman, Committee on Ways and Means (Fifth and Sixth Congresses); one of the managers appointed by the House of Representatives in 1798 to conduct the impeachment proceedings against William Blount; moved to Baltimore, Md., and engaged in the practice of law; served in the War of 1812, attaining the rank of major general; assisted in organizing the Baltimore Exchange Co. in 1815 and was a member of the first board of directors; member, State senate of Maryland; elected from Maryland to the United States Senate for the term beginning March 4, 1815, and served from January 1816 until December 1816, when he resigned; unsuccessful Federalist candidate for vice president in 1816; traveled extensively in Europe in 1819 and 1820; took a prominent part in the ceremonies on the occasion of Lafayette's visit to Baltimore in 1824; died in Baltimore, Md., January 14, 1825; interment in the family burial ground on his estate, "Oakland"; reinterment in Greenmount Cemetery, Baltimore, Md. Papers: Items in Benjamin Henry Latrobe papers, 1788-1820. Microtext edition published for the Maryland Historical Society, 1979, on 315 microfiche. Finding aid. Papers: 15 letters (1803-1823) in Edward M. Greenway collection, 1737-1876. Papers: 1796-1823. 1 container. Finding aid. Also 5 microfilm reels of originals in the Maryland Historical Society; and correspondence in Charles Simms papers, 1731-1822. Papers: Correspondence and papers (1747-1835) in various collections including 4 boxes in Harper-Pennington papers, 1784-1825; 19 items (1795-1828); letters in Bayard papers, 1796-1801, including letters to constituents reporting on acts of Congress; 55 items in Carroll-Harper papers, 1749-1896; 38 items relating to constitutionality of the admission of Louisiana to the Union, trial dates, and other cases and legal affairs in Harper letters, 1817-1912; and 35 items in Harper-Speed letters, 1820-1824. Available on 5 microfilm reels. Finding aid. Papers: 34 letters and documents (1789-1821) in various collections. Finding aid. Papers: 1 printed speech (1814) celebrating "the recent triumphs of the course of mankind in Germany" in Maryland manuscripts collection. Papers: Correspondence in Pierce Butler letterbook, 1790-1794. Papers: In Washington family papers, 1751-1870; and Burr family papers, 1750-1853. Cox, Joseph W. Champion of Southern Federalism: Robert Goodloe Harper of South Carolina. Port Washington, NY: Kennikat Press, 1972. Harper, Robert G. The Case of the Georgia Sales on the Mississippi Considered. 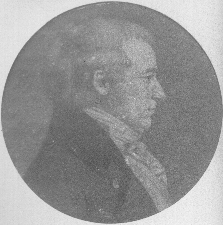 Philadelphia: Richard Folwell, 1799. ___. Observations on the Dispute Between the United States and France. 2d ed. Philadelphia: Thomas Bradford, 1797. ___. Select Works of Robert Goodloe Harper. Baltimore: O.H. Neilson Co., 1814. Harper, Robert G., and Robert Walsh, Jr. Correspondence Respecting Russia between Robert Goodloe Harper, Esq., and Robert Walsh, Jun. Philadelphia: W. Fry, 1813. Marks, Bayly Ellen, ed. Robert Goodloe Harper Family Papers. Wilmington, DE: Scholarly Resources, 1972. Microfilm. 5 reels and guide. Papenfuse, Eric Robert. The Evils of Necessity: Robert Goodloe Harper and the Moral Dilemma of Slavery. Philadelphia: American Philosophical Society, 1997. Sommerville, Charles W. Robert Goodloe Harper. Washington: Neale Co., 1899.